extremely functional in that they distribute the weight of the instrument over the shoulder very well. She was careful to create the strap without any plastic or metal buckles or pieces which might scratch a beloved guitar. And, her proprietary design work ended up creating a strap that won’t twist around during guitar changes on stage. 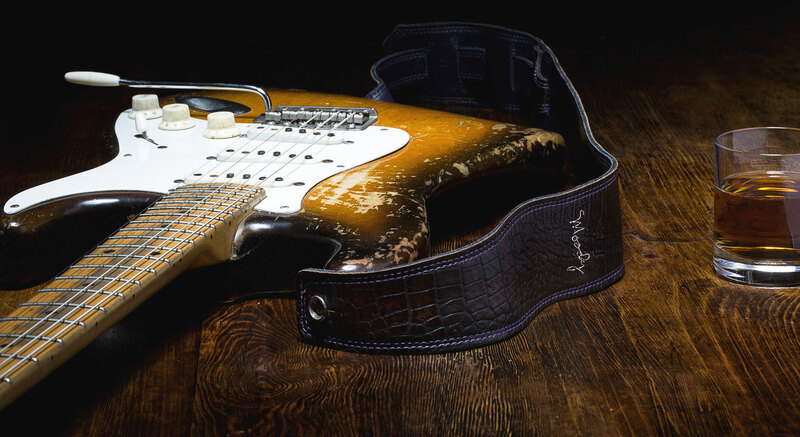 Because of her innovations, Moody is now the strap of choice for working guitarists and bass players. In the early years, Kathy O’Connell joined Allison and assisted with the manufacturing and marketing of the straps. Kathy proved to be a valuable partner and helped grow the business from its infancy to one with international distribution. We are all committed to making the best straps available anywhere – strap one on and you too will be convinced!